This week’s 404-word sample post was written by Verblio writer Lorraine A., who has written car reviews for nationally recognized publications. Along with reviewing the features of new cars, Lorraine has also written on car maintenance for dealers and service centers in the U.S. and Australia. Her favorite auto topics to cover include buy-versus-lease, synthetic motor oil, and different warranties for new and used vehicles. At Verblio, we help clients and agencies find experienced writers who can artfully cover topics in dozens of different industries. A sample like this one educates potential buyers about vehicle maintenance, while also driving them to make savvy car purchasing decisions. A new car, SUV, or truck is a wonderful vehicle. It is fresh and clean with your desired accessories. You also have an extended warranty that is one of the reasons for a new car purchase. But, you must follow the manufacturer’s recommendation for service to keep your car in good condition. Most new vehicles need servicing every 12 months or 12,000 miles. How often your car needs maintenance also depends on how hard you drive it. 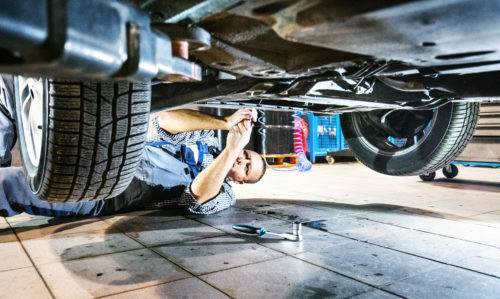 Heavy usage vehicles, off-road vehicles, and trucks that are used for work can get a full-service checkup every 6,000 miles. These are the major parts of a complete service check-up. You may find it necessary to check the oil and other fluids more frequently. Dashboard displays should warn you of any low fluids or other minor problems. Preparations for winter weather is also based on where you live. Your windshield wipers may need to be changed frequently in rainy climates such as the Pacific Northwest. The wiper fluid receptacle should always be full. Coolant and antifreeze should also be checked before winter. The antifreeze will keep your engine from freezing when the temperature drops. The vehicle’s manufacturer may have information on the type of antifreeze and engine oil preferred for cold weather. You may need to change to snow tires in some areas. You should check your tire pressure and tread depth before heavy winter weather if you don’t have need snow tires. Wet pavement requires tires that give you a good grip. A winter emergency kit is always a good idea. This includes flares, a flashlight, and blankets along with extra gloves and even a first-aid kit. You may need an extra ice scraper and shovel. Keep your cell phone charged, and it is a good idea to belong to a road service organization, even with a new car. Enjoy your new vehicle. It will last for many years and thousands of miles with proper maintenance.